Whether you’re a firm fan of raised garden beds or have only just discovered the versatility of garden planters, there are many benefits to lifting your fruit or vegetables above ground level. At Garden Larch we use high-quality four-way planed larch to ensure our garden planters are some of the best you’ll find – offering exceptional longevity and an aesthetic appeal that only improves with age. Larch is also one of the few woods that will resist rotting when in direct contact with the ground, allowing you to create raised garden beds in almost any location and on any surface. We offer standard sizes such as 1.5m long x 1m wide in 23mm or 45mm (approx 1” and 2”) thicknesses depending on your preference. If you need a particular size, just ask – we can make garden planters to almost any dimensions and our skilled craftsmen will ensure you can start the raised garden beds you’ve dreamed of without having to compromise on shape or size. Raised garden beds allow you to control the growing conditions for your fruit or vegetables far more precisely than ground-based planting, and garden planters benefit from improved drainage and an ability to more easily protect your crop with nets or cloches as required. 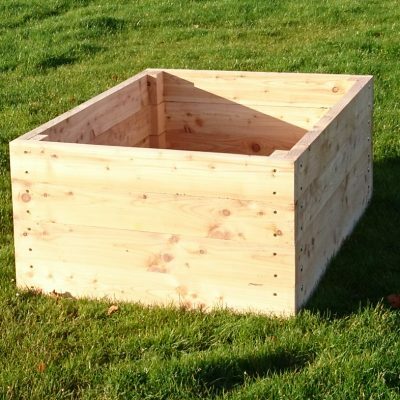 Browse our selection and start planning your raised garden beds today or call us now to discuss bespoke garden planters.